New Zealand needs leadership in road safety to reduce the rising number of deaths and injuries on our roads. We can all #SpeakUp, be road safety leaders and play a part in making roads safe. 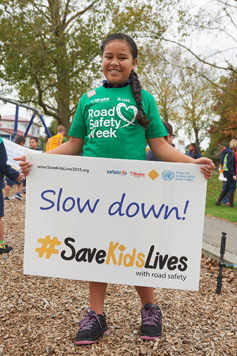 Road Safety Week 2019 (6-12 May) will coincide with the UN Global Road Safety Week and will have the theme 'Save Lives #SpeakUp'. New Zealand has a poor road safety record compared to some other developed countries. In 2018, 382 people lost their lives on our roads*. Issues such as drink driving, drug driving, distractions, speed and people not wearing seat belts contribute to a high number of deaths and serious injuries on our roads. We have a transport system that needs significant improvement to help save lives and reduce injuries on our roads. No death on the road is acceptable. Everyone should be entitled to safe and healthy mobility. A Vision Zero approach to road safety recognises that people make mistakes, and that the road system can help to reduce the severity of the outcome of those mistakes to help reduce deaths and serious injuries. A combination of measures to improve roads and roadsides, implement safe speed limits, improve the safety of vehicles and of road users, along with ensuring post-crash response is effective when a crash happens, has been proven overseas to save lives. Who can be a road safety leader? More details on our 2019 theme will be released shortly.